Apple pie is a traditional yet simple and delicious dessert for any number of holidays, whether it's Fourth of July, Thanksgiving, or Christmas, as well as a classic option for a casual dinner party. Because it's usually made with butter, traditional apple pie isn't vegan. However, by using vegan margarine or a vegan butter substitute, the dessert can be easily modified for vegans to enjoy, too. Preheat the oven to 350 degrees F. Roll the pie crust out into a 9-inch pie pan. Place the sliced apples in the prepared pie crust. Dot the apples with half of the vegan margarine. Stir the rest of the softened vegan margarine into the brown sugar. Add the cinnamon and nutmeg. Crumble the sugar mixture over the top of the apples. Place the pie in the oven and then bake for 45 to 50 minutes, or until the apples are very soft when pierced with a knife. Let the pie rest for 1 to 2 hours. Chopping the apples takes some time, so use an apple slicer if you have one available. If you can't find Granny Smith apples, use another variety that holds its shape. This includes Royal Gala, Empire, Cortland, or Golden Delicious. 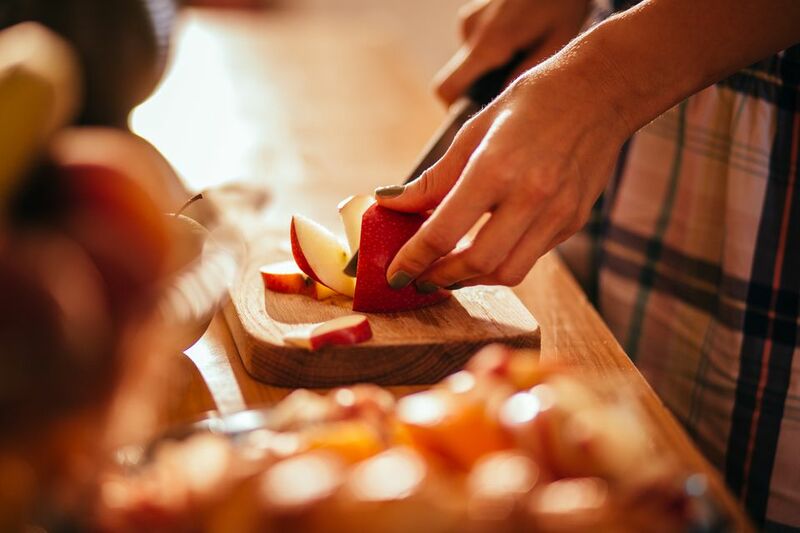 Varieties such as Red Delicious, McIntosh, and Braeburns all break down into mush during baking. Make sure to peel the apples, as the outside of an apple is too fibrous and tough for the pie filling. Don't skip the resting step after baking. This lets the filling set up to be appropriately juicy, rather than thin and runny. Double-crust apple pie: Make a traditional double-crust apple pie by layering a second pie crust over top of the apple, and pinching the two crusts together on the side with your fingers or a fork. If using the homemade vegan pie crust, double the recipe and roll out a second crust for the top of the pie. Homemade vegan pie crust: Instead of buying a pie crust, make your own vegan version. In a large bowl, combine 1 1/2 cups of all-purpose flour with 1/4 teaspoon salt, 1/2 teaspoon sugar, and 1/2 cup vegetable shortening or very cold vegan margarine. Use a fork or pastry cutter to cut the shortening or cold margarine into the flour until you have pea-sized crumbles. Mix in the almond milk until everything cups together. Roll out the pie crust on a clean work surface with flour sprinkled over it, and then drape it over the pie plate, cutting off the excess over the edges. Apple-cranberry pie: Eliminate one apple from the filling, and add 1 cup of fresh cranberries into the pie. Apple-pecan pie: Add 1 to 1/2 cups of chopped pecans (or walnuts, if you prefer) to the pie filling. Toast the nuts in a dry skillet beforehand for even more flavor.